Members of the Gowanus Canal Conservancy work on a windrow during their monthly compost build. Their site is one of more than 200 around the city already involved in reusing food waste that otherwise would be trucked to a landfill. In an empty lot on a dead-end Brooklyn street, a group of volunteers is stepping across the next frontier of New York’s waste saga with shovels and pitchforks. Soggy apples are split open with mushy thuds, wood chips cascade out of wheelbarrows and sawdust is spread with care. The Gowanus Canal Conservancy (GCC) is hosting its monthly compost build. GCC is one of 225 official community composting sites that help process local organic material, revitalize neighborhood ecology and educate people about the value of their food scraps. 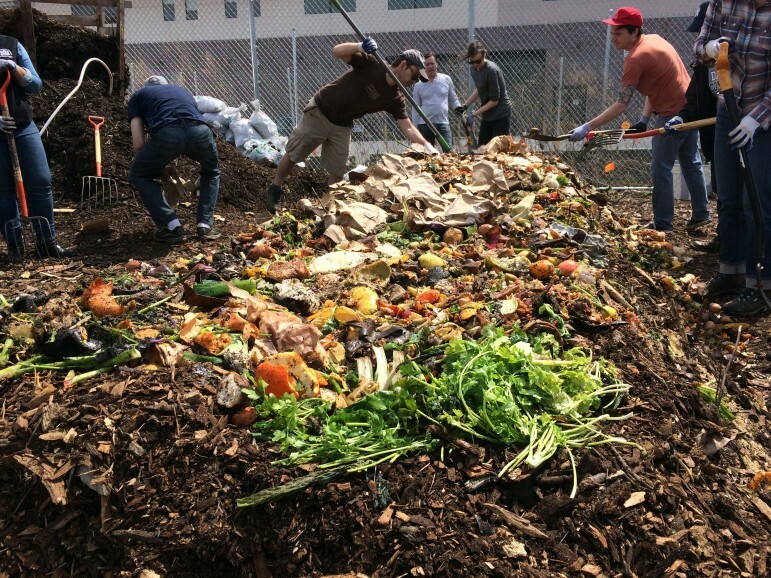 The group has come to build a windrow—one the simplest large-scale composting methods that doesn’t require heavy machinery—by layering 5,000 pounds of food scraps with “browns” such as wood chips and leaves to form a large mound. Over the next few weeks it will shrink as the scraps break down and eventually become usable compost. Standing next to a whiteboard with all of the details, compost coordinator LaToya Anderson sums up what it will take for New Yorkers to catch onto the idea of their food scraps being more than garbage. If the city has any hope of reaching its ambitious waste reduction goals by 2030, organics are the key to making it happen. Organic materials—food scraps, yard waste and soiled paper—make up more than 30 percent of the city’s garbage and are the biggest generators of greenhouse gases in landfills. Rather than burying them, the city plans to process them as natural resources closer to home. The Department of Sanitation (DSNY) is expanding its curbside organics collection pilot program with the goal of a citywide program by the end of 2018. According to a nationwide survey by industry publication “BioCycle,” New York is one of almost 200 communities with curbside organics collection across 19 states. While West Coast cities currently lead the way in this rapidly growing movement, New York could eventually surpass them in terms of people served if the city’s residential program reaches its full potential. The tricky part might not be getting people to hand over their organics, but figuring out where to process them. DSNY has been collecting organics, yard waste and soiled paper in select schools and neighborhoods across the city since 2013. Unlike most smaller composting operations, which don’t take meat or dairy, DSNY takes all materials and offers the convenience of home pick-up. Based on the latest figures, the city is collecting around 33 tons of material per day. By this summer the program will be in more than 133,000 households, 160 high-rise apartment buildings and 720 schools. The program’s budget is expanding accordingly and is projected to more than triple to approximately $5 million in Fiscal Year 2016. David Hurd, director of the Office of Recycling Outreach and Education at GrowNYC—the DSNY-funded non-profit behind the city’s Greenmarkets and environmental education efforts —says the program is going well. Most people catch on quickly after any initial reservations. “Everybody confronts you with the yuck factor,” he says, but adds that most people get over this by storing their food scraps in the freezer. Hurd says GrowNYC has had particular success in multi-unit buildings and thinks the program helps raise awareness about waste overall reduction. “I suspect that as people are provided more opportunities to recycle, they start realizing, ‘Maybe I don’t have to dispose of what I do dispose of,'” he says. Another potential benefit, though not yet proven, may be reducing the number of rats on city streets. 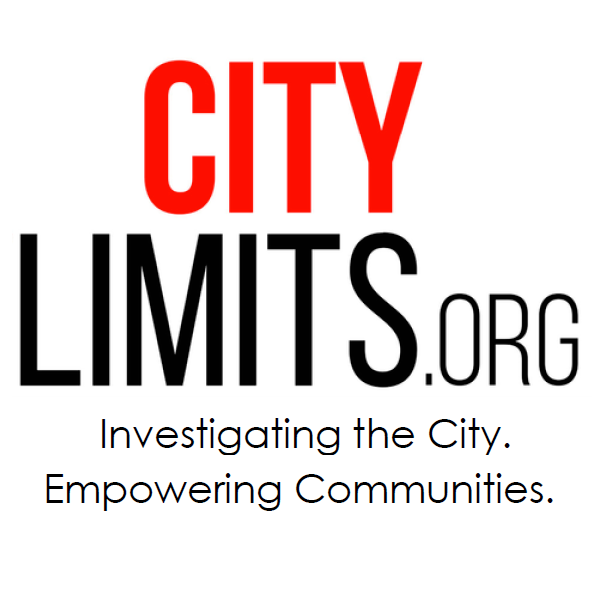 The Department of Health is currently conducting a study to see how rat populations are affected in certain neighborhoods which have the city’s collection pilot program. So far, results seem promising. Though never at this scale, the benefits of organics collection have been recognized in New York for years. DSNY started the NYC Compost Project in 1993 to teach people about composting and the importance of rebuilding natural soil. Since then it has expanded to seven sites throughout the city that process organic materials and educate residents. The program also offers master composter certification courses. Recently, it has even been setting up temporary food scrap drop-off sites at subway stops and libraries. Today, as many as 33 farmers markets across the city handle an average of 20 tons of organic material per week. Half of this material is processed by DSNY and the rest is split among several community composting sites in the city. One of those sites, Earth Matter on Governors Island, is part of the NYC Compost Project and welcomes visitors to learn more about the process. “It’s the easiest way to be green, to recycle your food scraps,” says Marisa DeDominicis, co-founder of Earth Matter. Thanks to some large equipment, such as a Bobcat tractor, Earth Matter can handle upwards of 16,000 pounds at a time. In addition to material from the island, bins of material collected at GrowNYC markets come over by truck on the ferry and are turned into windrows between abandoned rows of apartment buildings. Chickens walk freely across the piles to peck at pieces of decomposing vegetables and stale bread. Goats also live on site during the summer. Volunteers and visitors receive a warm welcome. DeDominicis says it’s important for people to see what happens to their food and learn how to grow more. “We hope that this whole trend of urban agriculture continues to grow people’s understanding that they’re part of that,” she says. While these community sites play an important role in the system, they’ll never be able to handle the large volumes that the city hopes to collect. Plus, most of these smaller sites don’t have the technology to handle meat, dairy or bones. All are beneficial to the end product compost and will soon be flowing into collection trucks with even greater frequency. Starting in July, commercial establishments that generate large amounts of food waste—restaurants, hotels, stadiums, hospitals—will be required to start separating their food scraps under Local Law 146 of 2013. Because of limited large-scale processing capacity in the region, DSNY is expected to phase this requirement in slowly. A few private carters have already been offering organics pick-up, but tonnages collected are nowhere near the estimated minimum of 1,000 tons per day that is thrown away at commercial food establishments. Factoring in residential food waste and other sources, New York likely generates more than 5,000 tons of organic material per day. Figuring out where to process it all is the city’s greatest challenge. Peninsula Compost in Delaware, the region’s major organics facility, was closed last fall because of environmental violations. DSNY has been trying to find an alternative destination ever since. One issue at Peninsula was that some of the material was too contaminated with non-food items. Organics from New York’s schools may have contributed to the problem because they often end up mixed with foam trays and plastic wrappers. To help limit the contamination, all schools will be switching over to compostable trays by the fall—part of a recent announcement with the five other largest school districts in the country. The school issue highlights the fact that not all food scraps are created equal. On top of contamination, different streams break down more easily than others using different methods. During a test program, DSNY pre-processed up to three tons of organics per day into a slurry before sending them to the Newtown Creek Wastewater Treatment Plant to be anaerobically digested along with sewage sludge. In the air-starved environment of the plant’s large “digester eggs,” bacteria break down the material and biogas is created that can heat homes. The remaining by-product, called biosolids, can later be turned into fertilizer. The egg-shaped digesters at the Newtown Creek Wastewater Treatment Plant. 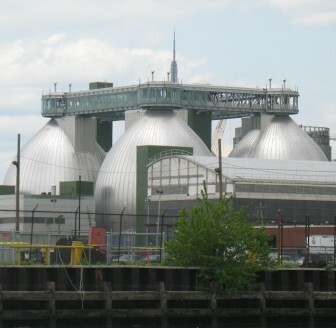 According to the OneNYC report, the Newtown Creek operation is being scaled up to accept 250 tons of food scraps per day and has the capacity to eventually handle up to 500 tons. This system could be replicated at other wastewater treatment plants, but current cumulative capacity is only about 1,000 tons. Even then, DSNY and the Department of Environmental Protection have found that a more homogeneous stream of commercial food waste will work better in the digester than yard waste or mixed food scraps from homes. “The way that I always put it is that the vegetarian diet needs to go outside and the diner diet needs to go into the digester,” says DSNY Commissioner Kathryn Garcia. Yard waste and other mixed items may be more suited to large windrows, either locally or outside the city. Garcia says she’s exploring all options within the region and is well aware of issues with processing capacity. “We know that and we’re working through that and we’ll need capacity on the private side as well. It definitely is one of the constraints that we’re working to resolve,” she says. But some say it’s a bad idea to expand collection without capacity first. “You can’t do this incrementally,” says Norman Steisel, a former DSNY commissioner and deputy mayor. He says that the discussion about technology often overshadows the bigger issue of location. Closer is better, though finding enough space nearby will be difficult. Steisel says that the optimal tonnage for anaerobic digesters is between 300 to 600 tons per day and the average facility takes up between 5 to 10 acres of land. Assuming even half of the city’s estimated 5,000 tons per day of organic material is collected, this could require five sites that will be next to impossible to find within city limits. That leads some people to believe that processing will inevitably have to happen outside the five boroughs. “It’s unrealistic to expect that all of the city’s food waste and yard waste can be composted within the confines of the five boroughs. Although, the closer the better from an environmental perspective,” says Eric Goldstein, senior attorney at the National Resource Defense Council. Any facility within the city would of course raise the question of siting. While composting facilities are different than garbage transfer stations, they would likely still require material to be transported via truck and could give off odors that may be associated with the general stigma of garbage. The city does have one small composting site in Freshkills Park on Staten Island, which it plans to expand, but that handles primarily yard waste and is only meant to service the borough. Until the question of local siting can be resolved, the majority of organics collected still get shipped upstate to McEnroe Farms or to New Milford Farms in Connecticut. Now that the city has laid out plans for expansion, the hope is that private companies will find ways to come and build their own infrastructure. In the meantime, DSNY will be expanding its household collection program to new neighborhoods next month and GrowNYC is still collecting food waste at farmers markets across the five boroughs. Benjamin Miller, a former director of policy planning for DSNY and author of the definitive book on city garbage history, says large-scale capacity is a crucial challenge to solve but that opportunities for local collection are important too. Based on weekend turnout at Brooklyn’s Grand Army Plaza Greenmarket, where master composter and retired postal worker Frederick Phillips helps out, people are beginning to catch on. Local residents fill bin after bin with their coffee grounds, banana peels and egg shells throughout the day. Those who are skeptical can quickly have their notions changed once they learn the value of their food scraps. However, clean food scraps should not be mixed with sewage sludge! Sewage sludge is full of all sorts of household and industrial toxins, and it’s an awful idea to use it as fertilizer in gardens or on farms. For many years, NYC sludge has been dumped on a poor, Hispanic community on the Mexican border of Texas (in Sierra Blanca, by a mob-related company called Merco Joint Ventures). Much also was pelletized in a stinky operation by another sketchy company, Synagro, in the NYOFCO (NY Organic Fertilizer Company) plant in the Bronx, which thankfully closed after an explosion at the plant (which isn’t unusual for such facilities). Their pelletized sludge was being brought by train to Florida to be dumped in the citrus groves, so that our Florida orange juice could have toxins from NYC sewage sludge in it! Not sure where most of NYC sludge goes now, but dumping it anywhere but landfills has been unjust and unhealthy. Keep the food scraps separate, so they can be used for compost, without the toxic sludge mixed in, please! Didn’t see any links to published reports; however, if what you contend is true and carting companies had been ruining the earth; its for the rest of us to ruin them first.